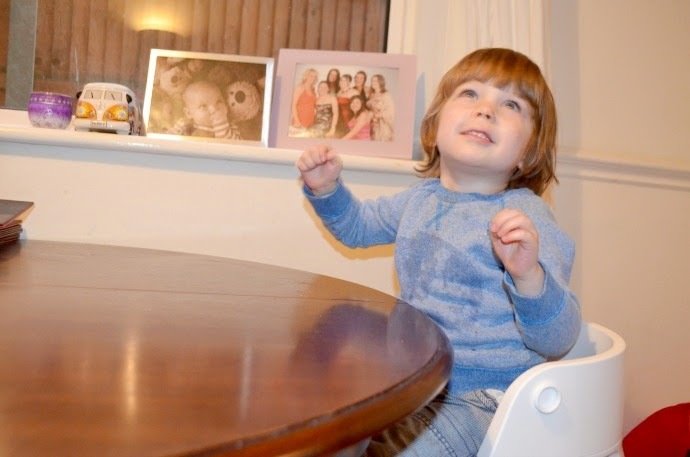 We were sent the new Stokke Steps Highchair a few weeks ago to test out and I have to say, I am completely won over. Its simplistic style, grown up colour options and wipe clean surfaces make it the perfect addition to our dining room. The Stokke Steps comes as a high seat, with an adjustable foot plate, that can slide up and down very simply. The chair is designed to be used this way from toddler upwards and whilst it was not built to accomodate a fully grown adult, I am still comfortably under the weight limit and can happily sit in it. 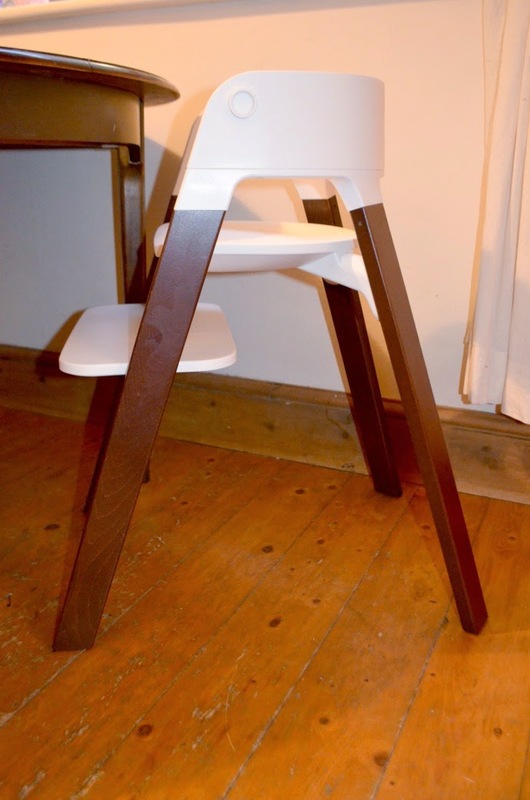 The steps is perfect for toddlers, who are out of the traditional high chair, but still need a bit of a boost to keep them at the right height, and with two shades of wood available, you can get one to match your current dining furniture. 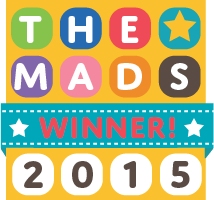 There are two optional add-ons, and we were sent the baby set, suitable from 6 months to 3 years. 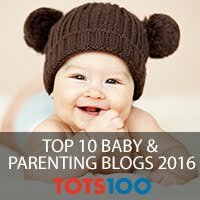 This set clips on and off very easily, so I can change who we use it for on a daily basis, and it has a 5 point harness (which is very necessary when your child wants to climb out and crawl across the table like mine!) You can also buy additional cushion sets to add some padding and colour, and these are removable and washable at 40 degrees. We have the red which is a gorgeous colour, not too bright and a great combination with the darker wood. The backrest has two possible positions, dependent on the size of your child, and can also be removed completely for older children who still need the bar at the front, but not the full restraint. 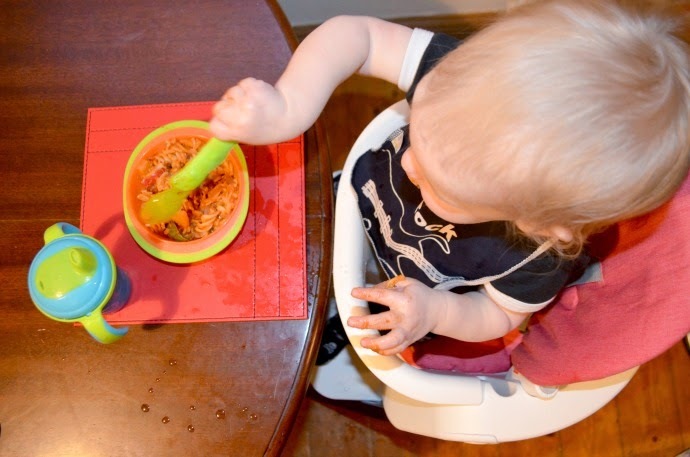 If you want to bring your younger child to the table and include them from birth, the new Stokke bouncer can also fit on the steps and I really love this idea. 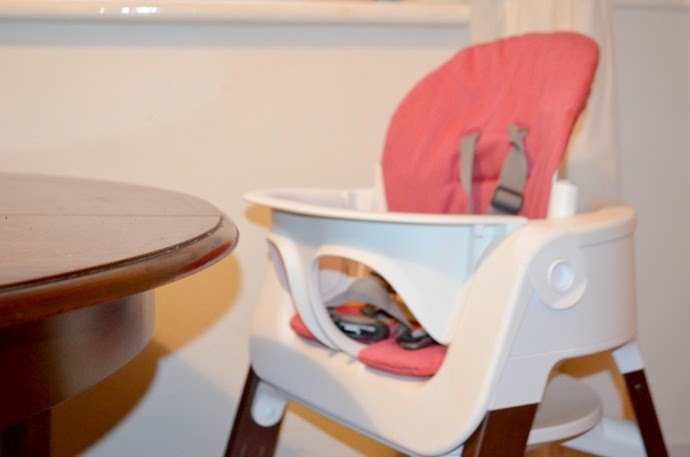 I spent far too many mealtimes rocking my children in a bouncer with my foot and it would have been much easier to have them at the table with us, watching the family meal time in preparation for joining in. Mealtimes around the table are such a sociable time, I think it would have been lovely to include them more. 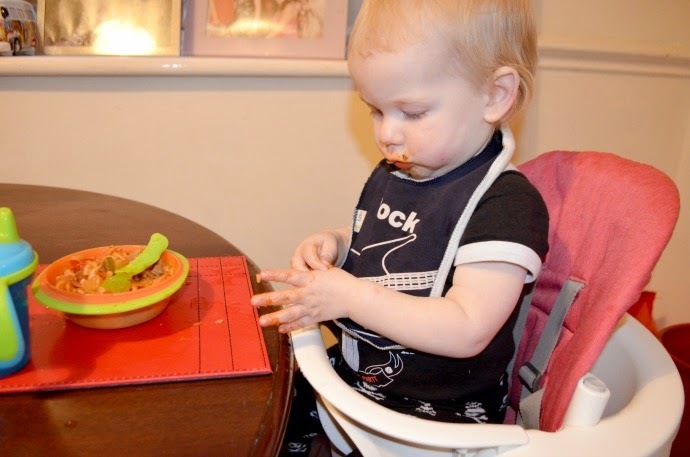 There is also a removable tray that can be added to the baby set, which is perfect for baby led weaning and for messy play at the table as it is nice and large. Although we have the fabrics for the seat, I think as Archie is now 13 months we may stop using them. He is incredibly messy with his eating and I find the covers a little fiddly to keep removing to wash. The seat still looks very comfortable without them and it is so easy to clean that way. 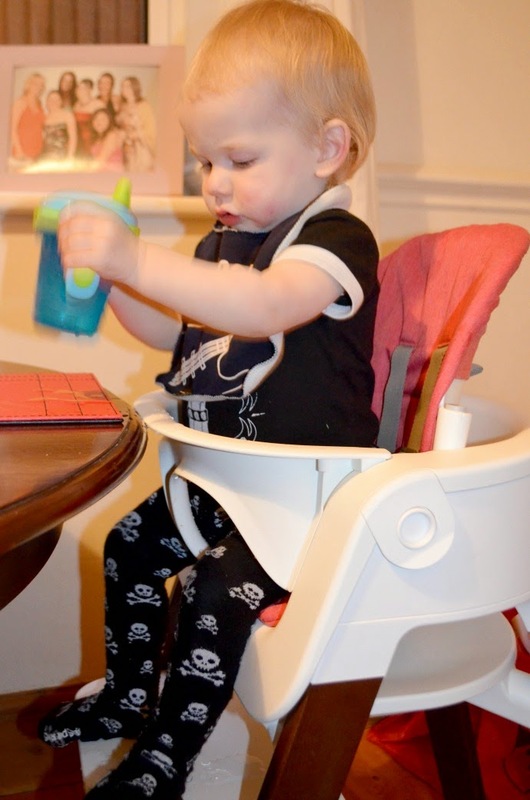 I absolutely love this high chair, it keeps our dining room looking neat, is perfect for both the children to use, will grow with them and it is easy to clean. It is well built and comes with a free 3 year guarantee. The products are the higher end of the market, with the steps retailing at £159, the baby set £79, the cushion set £33 and the bouncer £149, but this is a product built to last and I can definitely see me keeping this for the grandchildren. 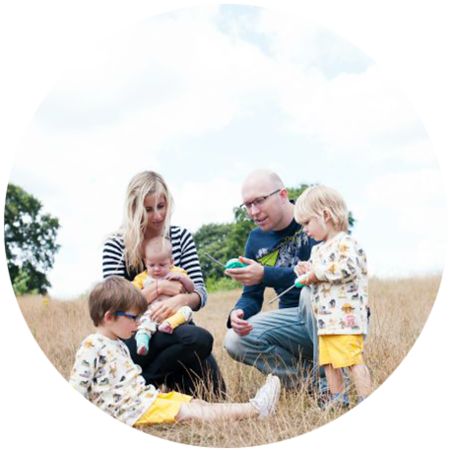 Stokke products are designed to keep children involved in the conversation, to put them at the right level to join in and encourage communication and I think the Steps is a perfect addition to the family. 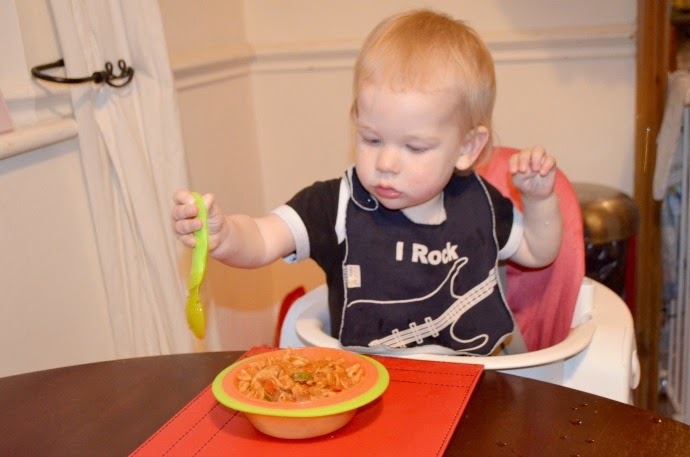 It helps get baby involved in the family from day one, and makes mealtimes more sociable.